Wether you are a couple, a family, friends, or with your baby … let yourself be temptet with a nature break in our beautiful South West region. For 20 years, the Sirguet Farm has produced foie gras and many regional products of duck. The Sirguet Farm enjoys a typical périgourdian charm with its pale stone buildings and its privileged location in the heart of the Pays des Bastides where you can find many medieval villages whose steep lanes come alive around farmers markets. In recent years, we offer atypical accommodation in the heart of the farm. 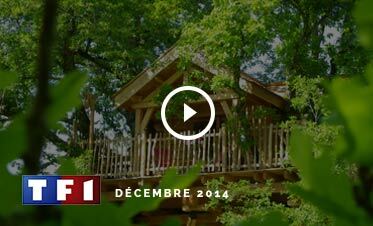 At the edge of a wood, our 4 Gipsy caravans and our 5 tree houses are installed on a site with trees and quiet. In addition to the scenery, our gipsy caravans provide top of the range comfort: fully equipped bathroom, equipped kitchenette, quality bed linen, heating… They can accommodate up to 5 people. Our 5 tree houses allow you to enjoy a lofty stay between 4 and 5 meters high in a real log cabin accommodating up to 5 people. 3 of them can welcom up to 5 people. This tree houses enjoy a modern living and unlimited comfort with fully equipped bathroom, equipped kitchenette, quality bed linen, heating… Each cabin has 2 bedrooms. 2 of them can welcome up to 2 people. This tree houses benefits of a very romantic atmosphere. They enjoy a room with Queen bed and a fully equipped bathroom.